RAML comes from RESTful API Modeling Language, and is a human readable and machine interpretable language for specifying and documenting APIs. RAML is based on YAML, being compliant with version 1.2, and helps designing RESTful APIs, encouraging the discovery and reuse of API patterns, leading to higher API quality by relying on standards and good practices. As it can be seen from the snippet, the API definition can make use of schemas which are used to define more complex resources. 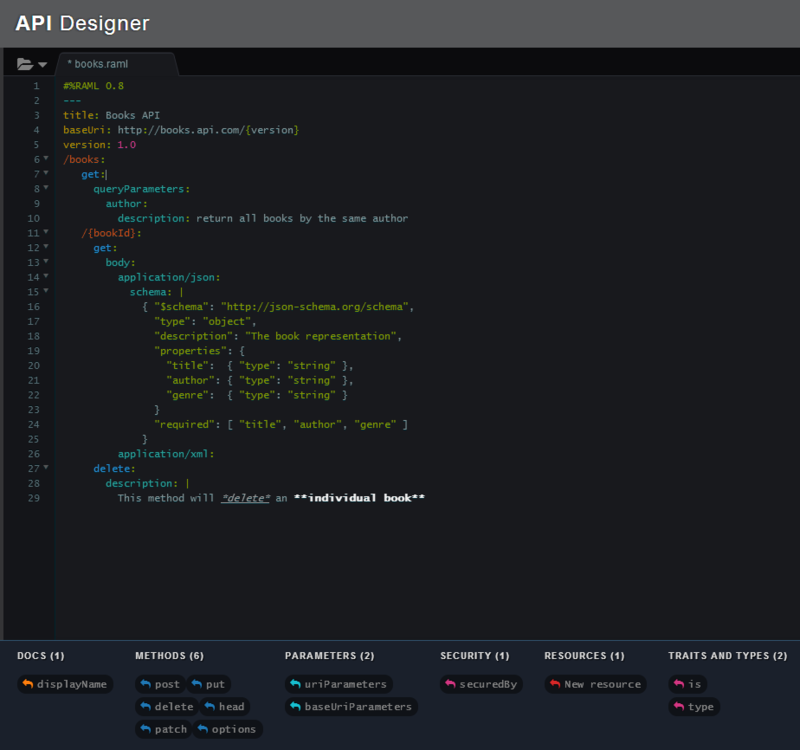 Also, at the bottom of the editor there are shown the methods, parameters, resources and other elements that are available at any point in API definition process. RAML is in its early days, and we want to make sure it evolves efficiently to solve today's urgent API design and description needs, without getting bogged down by overly-heavy formal governance. To that end, we've formed a workgroup of like-minded individuals from leading companies that place great value on APIs, and this group together with input from the community will drive RAML forward. The members can be found on the raml.org website. We'll adjust the membership over time to keep the group fresh and active, large enough to benefit from a variety of perspectives and small enough to stay nimble and focused on the goals. We invite the community to join in an open, vigorous discussion based on real-world, practical concerns as well as longer-term strategic goals. We think RAML already addresses many of the current issues faced by providers and consumers of practically-RESTful APIs, but by no means all of them. 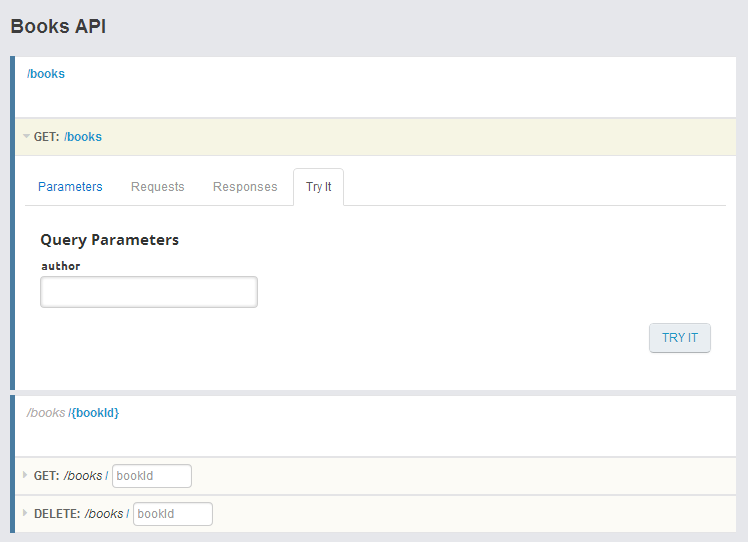 For example, we've not figured out how to capture the dependencies between input parameters such as the requested fields and output data such as the fields present in the response body -- or at least how to do so in a clean, powerful, intuitive way consistent with RAML's design goals. We're also not satisfied at this time, for JSON-based APIs, with just leaving the body representations to be characterized by JSON schema; they've not garnered nearly the broad adoption of XML schema, and they may not serve the needs of the RAML community as well as something else, perhaps. And looming ahead of us is the bigger question of the remaining REST design constraints, specifically hypermedia. Had we restricted RAML to purely-RESTful APIs, it would have 1) not applied to almost any existing APIs, and 2) not been feasible for most API initiatives to adopt today. So we're starting with the basics of REST APIs -- resources, methods, parameters, and bodies that need not be hypermedia -- and will evolve from there. RAML is currently version 0.8, the complete specification being available on GitHub at https://github.com/raml-org/raml-spec. Also, a RAML parser written in CoffeeScript is available.